A profoundly moving novel about two neighboring families in a suburban town, the friendship between their children, a tragedy that reverberates over four decades, and the power of forgiveness. Francis Gleeson and Brian Stanhope are two NYPD rookies assigned to the same Bronx precinct in 1973. They aren’t close friends on the job, but end up living next door to each other outside the city. What goes on behind closed doors in both houses—the loneliness of Francis’s wife, Lena, and the instability of Brian’s wife, Anne, sets the stage for the stunning events to come. 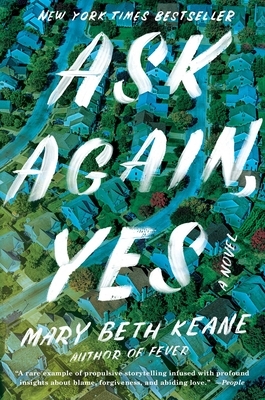 Ask Again, Yes by award-winning author Mary Beth Keane, is a beautifully moving exploration of the friendship and love that blossoms between Francis’s youngest daughter, Kate, and Brian’s son, Peter, who are born six months apart. In the spring of Kate and Peter’s eighth grade year a violent event divides the neighbors, the Stanhopes are forced to move away, and the children are forbidden to have any further contact. But Kate and Peter find a way back to each other, and their relationship is tested by the echoes from their past. Ask Again, Yes reveals how the events of childhood look different when reexamined from the distance of adulthood—villains lose their menace, and those who appeared innocent seem less so. Kate and Peter’s love story is marked by tenderness, generosity, and grace. Mary Beth Keane was born in the Bronx to Irish parents and grew up in Rockland County, New York. She attended Barnard College and the University of Virginia, where she received an MFA in Fiction. In 2011, she was named one of the National Book Foundation’s “5 under 35,” and in 2015 she was awarded a John S. Guggenheim fellowship for fiction writing. She currently lives in Pearl River, New York with her husband and their two sons. She is the author of The Walking People, Fever, and Ask Again, Yes. "I devoured this astonishing tale of two families linked by chance, love, and tragedy. Mary Beth Keane gives us characters so complex and alive that I find myself still thinking of them days after turning the final page. A must-read."